First Baptist Church - Stained Glass Inc.
A contractor out of Louisville, KY was working on a renovation of the First Baptist Church of Taylorsville when he contacted Stained Glass Inc. concerning stained glass window panels. His client was looking for custom made stained glass at an affordable price. While the church committee hadn’t found an exact design that they loved, they had a general idea for their church windows in mind. This was not a problem for Stained Glass Inc. Our artists took their concept and were able to custom design six beautiful images from scratch. 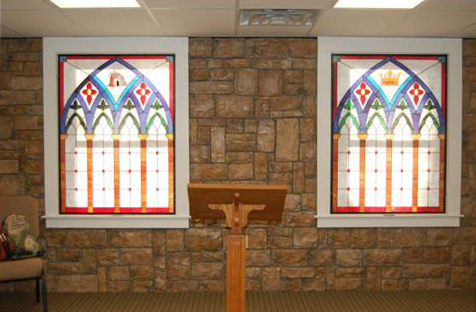 Each stained glass insert shares a common arch design with classic columns and colorful, floral filigree while each panel displays a different Christian image, including the loaves and fishes, the Nativity, Christ’s baptism, a crown, three crosses and the empty tomb. These designs were then heat fused to the approximately 3 ½ by 4 ½ foot windows providing brilliant, fade resistant color. Once the renovation was complete a dedication took place and the stunning windows did not go unnoticed. The church congregation was thrilled with the new addition and “the dedication went great. Everyone loved the windows.” -Mike, Howell & Howell Contractors, Inc.